SINGAPORE (HERWORLD) - Hailed as the "unsung heroine of Singapore" by President Halimah Yacob, Mrs Wee Kim Wee was known for being many things - an advocate for disadvantaged children, an extraordinary talent in the kitchen, and a selfless woman of quiet grace. Many who encountered her have commented on her warmth and kindness. While we mourn her death, we also wish to celebrate her life. Here's a list of facts, from her contributions to Singapore's communities to her relationships, that you might not have previously known about. Here's to Mrs Wee, our former First Lady. While Dr Wee Kim Wee came from a very humble background, Mrs Wee was born to a Hokkien businessman. She was the daughter of Khor Chwee Thor, who built transportation boats; and Koh See Neo, a nyonya woman. Mrs Wee, whose maiden name was Koh Sok Hiong, was the eldest amongst their eight children. She studied in Hwa Chiau Chinese and English School and Nanyang Girls' High School before she was married to Dr Wee. In fact, their wedding ceremony was conducted in Mandarin in the United Chinese Library. She understood every word spoken, whereas Dr Wee revealed in his 2004 memoirs - Wee Kim Wee: Glimpses and Reflections - that he did not. 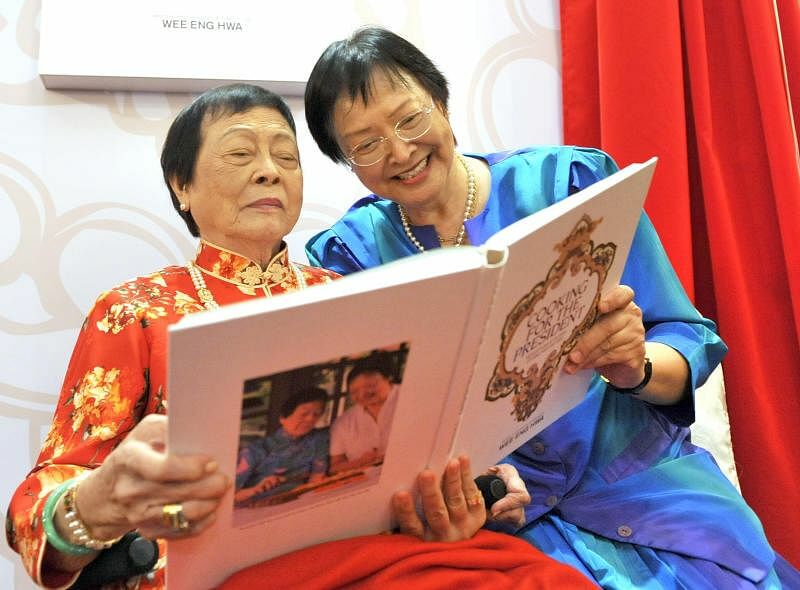 According to the book In the Mood for Cheongsam (2012), she was only 18 years old when she married Dr Wee, and that they had only known each other for a year before tying the knot in 1936. Theirs is a storied romance, with Mrs Wee constantly by her husband's side, as he rose from journalist to politician. They are survived by six children, 13 grandchildren, and 17 great-grandchildren. She has said that on her wedding night, Dr Wee dug into his pocket, and pressed all the money he had then (about $1.75) into her hand and proclaimed that "I have no money. But whatever I have I give to you". From that moment on, she resolved to be the perfect wife. She drew on all the skills she had at hand to support her husband. She began cooking at the age of 10, learning culinary skills from her grandmother. When Dr Wee was appointed as High Commissioner to Malaysia and Ambassador to Japan and Republic of Korea during 1973 to 1984, Mrs Wee personally prepared food for dinner parties and receptions. Dr Wee's personal assistant from 1980 to 1983, Sylvia Toh, noted that Mrs Wee was exceptional at "managing a formal sit down official dinner for 20 guests" and that "she could even cook for Singapore's National Day reception for 500 to 600 guests". From 1985 to 1993, when Dr Wee served as Singapore's President, Mrs Wee truly came into her own. She was lauded for playing a very active role, taking on much work for charities and philanthropy work. This continued long after she was officially released from her duties, and charities she supported even in her later years included Girl Guides Singapore; Jamiyah Home for the Aged; Life Community Services Society; Trybe Limited as well as the Wee Kim Wee Legacy Fund for NTU's Wee Kim Wee School of Communication and Information. In a 2011 interview, Mrs Wee's daughter Maureen Wee Bee Neo revealed that her mother took care of everything for her children. She would cook for them, of course, but also give them haircuts and tailor their clothes. Dr Wee has reportedly said that as the family matriarch, she "put in almost 14 to 16 hours daily, seven days a week, 365 days a year" into taking care of the family. Mrs Wee's cookbook - Cooking For The President: Reflections & Recipes of Mrs Wee Kim Wee - written and published by her daughter Mrs Wee Eng Wah in 2011, included a whopping 227 recipes from the late Mrs Wee. But by the time the cookbook was published, Mrs Wee herself was already a writer. An accomplished chef, she was published under her maiden name, Koh Sok Hiong, donating many of her Nyonya recipes to Her World in 1965, under a column titled "Malaysian Kitchen". Cooking for the President is lauded as a book that carefully documented Peranakan cooking, and was widely used by home chefs. It's no wonder, since dishes include Sa Po Fan (claypot rice), Sambal Udang (chilli paste prawns), Ikan Tempera (Nyonya sweet & sour fish) and Nasi Goreng Rempah (belachan fried rice). Desserts were definitely Mrs Wee's forte, with the largest section dedicated to sweet treats. The 52 recipes in that section includes classics like Buboh Cha Cha and Ang Ku Kueh, as well as the more unusual like Kueh Kuriah (coconut tapioca doughnuts). The book is very detailed, with illustrations of every dish, and even how to properly slice and dice vegetables, like sayoh bayam (spinach) and sayoh paku (fiddlehead ferns). The cookbook, she has said, was a project that aimed to preserve the heritage of Peranakan cooking for future generations. One of her cheongsams, which was fashioned in black with floral embroidery detail, was featured in an exhibition at the National Gallery of Singapore in 2012, alongside some other cheongsams worn by the other First Ladies of Singapore, such as the late Mrs Ong Teng Cheong and Mrs Benjamin Shears. According to fashion consultant and celebrity stylist Daniel Boey, her tailor worked with her since she was 30 years old, and has made her over 100 cheongsams. After suffering from a stroke in 2015 - and despite having to be fed through a tube - her family would put a little durian on a spoon, and let her have a taste. Her love of food was such that her family would move her into the kitchen whenever meals were being prepared, so she could smell the food and watch the cooks at work. Durian is featured in her cookbook, where you'll find the dessert recipe Kueh Wajek Durian (Gula melaka coconut milk durian glutinous rice fudge). According to a passage in Cooking for the President, Mrs Wee taught her daughter, Maureen, about the "art of kitchen management" where all ingredients were maximised. Every scrap was used. It extended beyond the kitchen; lights had to be switched off when not in use, plastic boxes were recycled, and even water from fish tanks was used to water the plants.